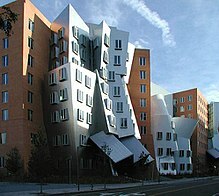 The MIT Media Lab houses researchers developing novel uses of computer technology. Shown here is the 1982 building, designed by I.M. Pei, with an extension (right of photo) designed by Fumihiko Maki opened in March 2010. 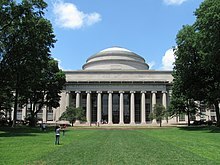 معهد ماساتشوستس للتكنولوجيا أو معهد ماساتشوستس للتقنية Massachusetts Institute of Technology هي جامعة بمدينة كامبريدج بولاية ماساتشوستس تأسست سنة 1861. ويعتبرالمعهد ده من المعاهد المتقدمه عالميا فى مجال التكنولوجيا. ↑ أ ب "Enrollment Statistics". MIT Registrar. Retrieved September 13, 2014. الصفحه دى اتعدلت اخر مره فى 21 ديسمبر 2016,‏ 06:42.